Freddie Timms (Ngarrmaliny) was born circa 1946 at Ngarrmaliny (Police Hole), near Foal Creek, Bedford Downs Station, WA. He belongs to the Gija language group, and is based at Frog Hollow, WA. A stockman for many years at various large stations in the Kimberley, Timms began painting for Waringarri Arts in the 1980s whilst living at Warmun in the same community as his father-in-law George Mung Mung and others including Rover Thomas, Jack Britten and Hector Jandany. His paintings are spiritual maps of his country, painted as though from an aerial perspective. Large tracts of his country are underwater, as a result of the man-made Lake Argyle. Timms has said of his paintings at Darwin’s Raft gallery, ‘I think about the country where I was walking and camping, all the main water holes, all the camping areas. I remember the places where I used to go mustering and I follow them up with my painting.’ Usually painting in ochre his works have also included various series which use bright reds, greens and other acrylics. 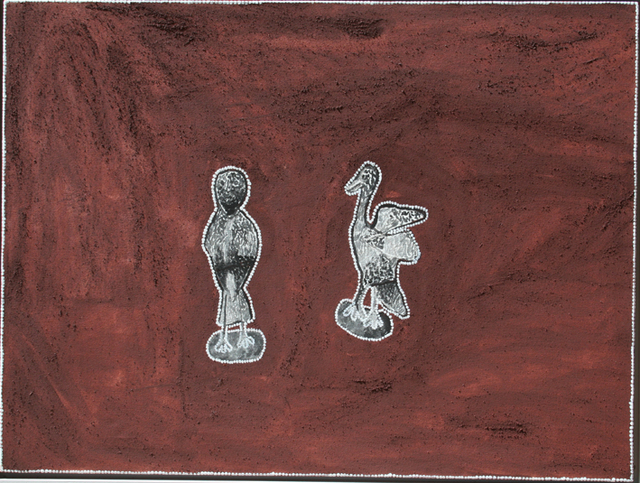 In the 1990s he became a founding member of the now-defunct Jirrawun Aboriginal Art Corporation and now paints with Red Rock Art Gallery in Kununurra, WA. 10.05.11 | IS ABORIGINAL ART BACK TO ITS AUCTION PEAK?